CLEARLY I haven’t been to Sydney’s Kinokuniya in Town Hall in a long time, because I had no idea that the latest volume of The Disappearance of Nagato Yuki-chan was released last month, on September 23, 2014. Volume 6 is the latest of the English translated volumes, but I wouldn’t have known this if I hadn’t come across the cover of Volume 7 of the manga, quite by chance. Listed as an ‘ongoing’ series, it’s a sure thing that we’ll definitely be seeing at least a Volume 8, and I still haven’t even gone around to taking the shrink wrap off Volume 5 bought in February of this year. It’s actually rather exciting the release schedule is so close this time! A visit to Kinokuniya is certainly on the horizon now, but even more exciting will be when the new Nagato Yuki no Shoushitsu anime is released (last I read, 2015). While I’m looking forward to another KyoAni series, I can’t deny that the one Disappearance product I really want though, is the 4koma that sparked the series; and the original Disappearance I read before the manga series. That was additionally sparked by The Melancholy of Suzumiya Haruhi-chan, as you can tell. As a special though, you’re not likely to find this on sale… at least not for any reasonable price you can imagine. A pity. 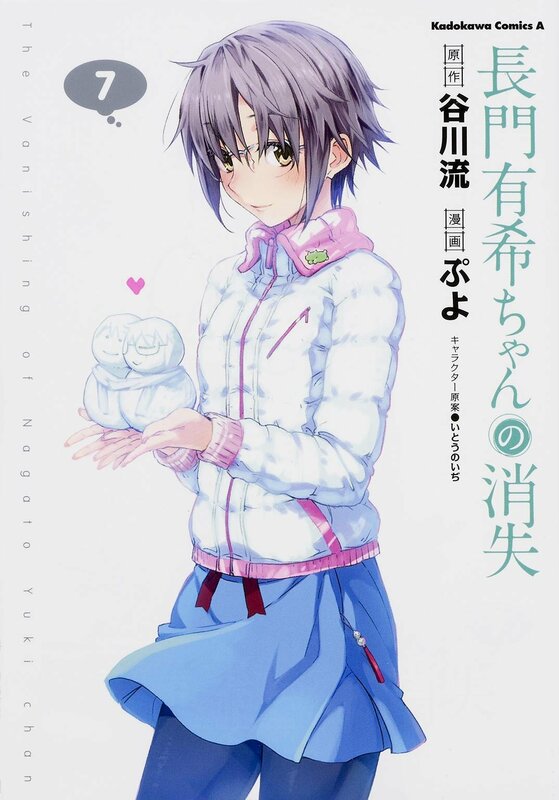 Now take a closer look and tell me if you can see what Yuki is holding in the Volume 7 cover. Progress? We shall see.